This page is written by one of the game's inventor, Fergus Duniho. This game is a favorite of one of its inventors, Fergus Duniho. One characteristic of Shogi is that all pieces are immortal. Captured pieces change sides but never leave the game. This game introduces mortality to the pieces in Shogi without losing the ability to drop captured pieces. Captured pieces are demoted to the next lowest ranking piece -- when there is a lower ranking piece. When there isn't, the captured piece is removed from the game. 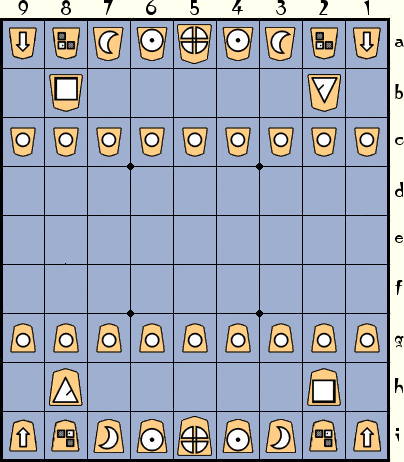 This game is a variant of Mortal Shogi, which was inspired by Mortal Chessgi. Mortal Shogi introduced mortality to Shogi in the same manner that Mortal Chessgi added it to Chessgi. Kamikaze Mortal Shogi moves further away from Shogi in order to move closer to it. It does this by adding a new piece, the Kamikaze. In Mortal Shogi, captured Pawns were removed from the game, and this immediately makes the gameplay less like Shogi. In Kamikaze Mortal Shogi, the gameplay is a little bit more like Shogi, because capturing a Pawn still gives you something to put in hand. This is the Kamikaze. Historically, Kamikazes were Japanese pilots who went on suicide missions during World War II. Whenever a Kamikaze is captured or captures another piece, it is removed from the game. Mortal Chessgi was created by Fergus Duniho. This inspired Roberto Lavieri with the idea for Mortal Shogi, which Fergus and Roberto subsequently collaborated on. Kamikaze Mortal Shogi is a variant of Mortal Shogi created by Fergus Duniho. The initial setup is exactly the same as it is for Shogi. All pieces but the Kamikaze come from Shogi. They move the same but are subject to different rules concerning promotion and demotion. The usual promoted forms of Pawn, Knight, Lance, and Silver General are not used in this game. Instead, these pieces simply promote to higher ranking pieces. King The King moves one space in any direction, but not into check. The object is to checkmate the King. Dragon King The Dragon King moves like a Rook or one space diagonally. A captured Dragon King demotes to a Dragon Horse. Dragon Horse The Dragon Horse moves like a Bishop or one space orthogonally. A captured Dragon Horse demotes to a Rook. Rook The Rook moves just the same as in Chess. It slides over any number of empty spaces vertically or horizontally, ending its move by capturing a piece or stopping on an empty space. When it enters, exits, or moves within the promotion zone, a Rook may promote to a Dragon King. A captured Rook demotes to a Bishop. Bishop A Bishop moves just the same as in Chess. It slides over any number of empty spaces in any diagonal direction, ending its move by capturing a piece or stopping on an empty space. When it enters, exits, or moves within the promotion zone, a Bishop may promote to a Dragon Horse. A captured Bishop demotes to a Gold General. Gold General A Gold General moves one space in any forward or orthogonal direction. This is any direction except diagonally backwards. A Gold General does not promote to anything. A captured Gold General demotes to a Silver General. Silver General A Silver General moves one space in any forward or diagonal direction. When it enters, exits, or moves within the promotion zone, it may promote to a Gold General. A captured Silver General demotes to a Lance. Lance A Lance moves like a Rook but only forward. It may slide vertically forward over any number of empty spaces, ending its move by capturing a piece or stopping on an empty space. When it enters or moves within the promotion zone, it may promote to a Silver General or a Gold General. Upon reaching the last rank, it must promote to one of these. A captured Lance demotes to a Knight. A Lance in hand may not be dropped on the last rank. Knight A Knight has the two forward-most moves of a Chess Knight. It may leap to either of the two spaces that could be reached by moving two spaces forward, followed by one more space left or right. When it enters or moves within the promotion zone, it may promote to a Lance, Silver General, or Gold General. Upon reaching the last rank, it must promote to a Silver General or a Gold General. A captured Knight demotes to a Pawn. A Knight in hand may not be dropped on either of the last two ranks. Pawn A Pawn moves one space vertically forward, both for capturing and not capturing. When it enters the promotion zone, it may promote to a Knight, Lance, Silver General, or Gold General. When it reaches the second-to-last rank, it may promote to a Lance, Silver General, or Gold General. Upon reaching the last rank, it must promote to a Silver General or Gold General. A captured Pawn demotes to a Kamikaze. A Pawn in hand may not be dropped on the last rank, nor in any file with another Pawn belonging to the same side, nor if it would checkmate the enemy King. Kamikaze The Kamikaze is the only new piece in Kamikaze Mortal Shogi. It leaps two spaces vertically forward. When it captures a piece or gets captured, it is removed from the game. This is so even in the promotion zone. It may promote only by moving to an empty space in the promotion zone. When it moves to the first rank of the promotion zone, it may promote to a Knight, Lance, Silver General or Gold General. It may never promote to a Pawn. When it moves to the middle rank of the promotion zone, it must promote to a Lance, Silver General, or Gold General. When it moves to the last rank, it must promote to a Silver General or a Gold General. A Kamikaze in hand may not be dropped on the last two ranks. Kamikaze Mortal Shogi is played like Shogi, except for the rules concerning captures and promotions. As in Shogi, the object is to checkmate the King, and the Black side, which begins on ranks g, h, and i, moves first. Whenever a Kamikaze is captured, it is not put in hand. Instead of this, it is removed from the game. Whenever any other piece is captured, it demotes to the next lowest ranking piece, following this order from highest to lowest: Dragon King, Dragon Horse, Rook, Bishop, Gold General, Silver General, Lance, Knight, Pawn, Kamikaze. This is the order that the pieces are listed in above. This replaces the rule in Shogi that promoted pieces demote back to their unpromoted forms. After demotion, a captured piece changes sides and is held in hand by the capturing player, who may drop it on a subsequent turn. As in Shogi, certain pieces may promote by entering, exiting, or moving within the promotion zone, which is for each player the last three ranks from his own perspective. The pieces that may promote are the Pawn, Knight, Lance, Silver General, Bishop, Rook, and Kamikaze. This is the same as in Shogi with the addition of the Kamikaze. As in Shogi, Bishops promote to Dragon Horses, and Rooks promote to Dragon Kings. Unlike Shogi, this game does not distinguish between Tokins, promoted Lances, promoted Knights, and promoted Silver Generals. Instead, when any piece lower ranking than a Gold General has the opportunity to promote, it may promote to a higher ranking piece. Which pieces any piece may promote to are given in the piece descriptions. The general rule is that any piece ranked lower than a Gold General may promote to any higher ranking piece between a Knight and a Gold General, inclusive, provided there are spaces remaining on the board that it could legally move to as the piece it promotes to. So, nothing may promote to a Lance once it reaches the last rank, and nothing may promote to a Knight once it reaches either of the last two ranks. Also, a piece must promote whenever it moves to a space from which it has no more possible moves. This applies to the Knight and Kamikaze, which must both promote upon reaching either of the last two ranks, and to the Lance and Pawn, which must promote upon reaching the last rank. Dropping rules are just the same as in Shogi. With certain restrictions, a piece may be dropped on any empty space. An obvious restriction on any drop is that the resulting position must be legal. A second restriction on each piece, though applicable to only a few, is that there must be spaces remaining on the board to which it could legally move. Thus, Pawns and Lances may not be dropped on the last rank, and Knights and Kamikazes may not be dropped on either of the last two ranks. Finally, there are a couple more restrictions for dropping Pawns. First, a Pawn may not be dropped in any file that already has a Pawn belonging to the same side. Second, a Pawn drop may never be used to checkmate the enemy King. If you have version 2 of Zillions of Games installed on your computer, you can play this game. To play Shogi, Mortal Shogi, or this game, download file: fdshogi.zip. Unlike Shogi, it is possible to have more of some piece than you started out with. To cover all possibilities, even the most extreme, you will need ten Shogi sets. If you choose to make individual pieces instead of collecting ten sets, you will need 38 each of Pawns, Knights, Lances, Silver Generals, and Gold Generals, 4 each of Dragon Kings, Dragon Horses, Rooks, and Bishops, and only 2 Kings. The Pawn's promoted side may be used for Kamikazes. This game is best suited for playing over a computer interface, such as Zillions of Games or Game Courier. Another cool concept by Fergus, this time in the field of shogi variants. Also a comment about the opening - the player with the first move has a very aggressive attack by marching the rook-pawn up, forcing an exchange, and dropping a kamikaze on 2c, which is protected by the rook and attacks the trapped knight. You have to respond to this attack immediately to prevent it. Thanks, Greg. There is a reason I consider this to be my best Chess variant, and you hit on it quite well. Huge thanks go to Roberto Lavieri, who came up with the initial idea for Mortal Shogi and who also came up with the underpromotion rule, which I think has made this game a lot more interesting. Thanks also go to Karl Scherer, whose Hydra Chess inspired Mortal Chessgi. This is fantastic game; one of my favorites of all time. I love shogi, but this game even improves on the classic. The biggest difference is not the fact that the pieces get weaker with each capture, nor is it the addition of the kamikaze. I find the biggest difference to be the change in the promotion rules, which has profound implications... In shogi, when you promote a pawn, you get a piece that has the fighting power of a gold general. But, when the opponent captures it, all he gets is a pawn. This makes promotion a terrific thing. In this game, though, if you choose to promote it to a gold, it fights as a gold, but when the opponent captures it, he gets a silver (i.e., the gold general demoted one step.) So promotion is double-edged. If it's going to get captured, (and, in combat areas, pieces are captured and re-dropped a lot,) you're really just giving your opponent a more powerful piece by promoting. For this reason, holes in the promotion zone aren't nearly as deadly as in regular shogi. In shogi, a gold general is slightly stronger than a silver, but only slightly, and, in some situations, the silver is actually better because it's diagonal move helps it to slip through the pawns. In this variant, I feel that unless the current situation specifically needs a gold, the silver is actually much better. The fighting power is very similar, but when your gold gets captured, you give the opponent a silver; when your silver gets captured, he only gets a lance. That's a pretty big difference. Also, promoting a bishop or rook is very dangerous. If you promote your bishop to a dragon horse, for example, you better not let it get captured, or you've handed your opponent a rook! (which can probably be promoted to a dragon king!) When it's still a bishop, though, if it gets captured, you're only giving your opponent a gold (which can't even be promoted.) I find that with the introduction of the kamikaze, the opening becomes intense very quickly, much more quickly than shogi. Later in the game, though, because of the promotion change resulting in promotion being risky and holes in the promotion zone being much less significant, I find the game stays even much longer. When a player starts losing (measured in conventional terms - he has less material) he starts to gain a strange advantage. The opponent's 'stronger' pieces can't engage because they can't risk getting taken by a 'weaker' piece, because if that trade takes place, the player who had the weaker piece now gets a stronger piece in hand, and, even if the other player can recapture, he only gets a piece even weaker than the weaker piece already was... This is like the 'leveling effect' described by Ralph Betza, but to a much greater extreme, leading to very intense games that are in doubt right up until the end. Author: Fergus Duniho. Inventor: Fergus Duniho and Roberto Lavieri.